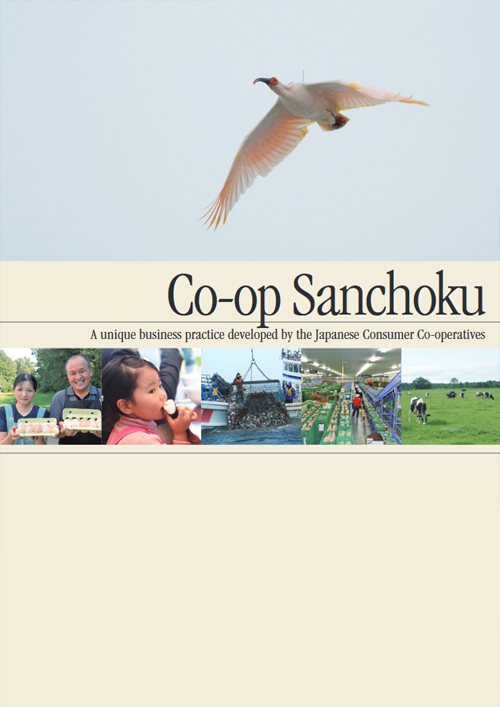 Japanese Consumers’ Co-operative Union (JCCU) publishes Consumer Co-ops' Social Activities Report every year to share the concept and achievement on social responsibility and social roles played by JCCU and its member co-ops. A variety of social activities are introduced from the perspectives of both consumer co-ops’ businesses and activities. This page introduces businesses and activities mainly from Consumer Co-ops' Social Activities Report 2018. Consumer co-ops contribute to the creation of communities in cooperation with local administrations (governments) and various organizations. Consumer co-ops run store, home delivery, insurance, and welfare business and promote cooperation among these businesses with the aim of realizing members’ wishes. Consumer co-ops make continuous efforts to achieve a sustainable and a peaceful society. Consumer co-ops create an organizational culture where everyone can work with motivation. Consumer co-ops contribute to the creation of communities in cooperation with local administrations (governments) and various organizations, utilizing their business infrastructures and activity networks. In 2017, many natural disasters hit Japan, causing serious damages. Consumer co-ops carried out restoration assistance including donations for quick recovery of disaster areas. FCO・OP in Fukuoka Prefecture helped the victims remove soils from houses and clean up houses with the volunteer groups from consumer co-ops in the Kyushu area, in addition to providing relief supplies and warm meals. JCCU called on its member co-ops nationwide for disaster relief donations. 141 consumer co-ops and business federations responded to the call and donated a total amount of 266.7 million yen (as of December 2017). Consumer co-ops carry out a variety of businesses and activities to help people in need. A foundation established by Co-op Mirai operating in Chiba, Saitama and Tokyo Prefectures initiated a grant-type scholarship program for its members. This scholarship can be applied for by high school students of single parents or those without parents. A student receives a monthly maximum amount of 10,000 yen until graduation. The main financial resource is donations from members who support this program. Consumer co-ops carry out various activities, such as Children’s Cafeteria and Children’s Future Action. Co-ops also run social businesses, such as consultation and temporary cash loans for living expenses. Food Bank is an activity to distribute food to people in need. Food Drive, a part of the Food Bank, is to collect unused food from households. Consumer co-ops support Food Bank activities in various ways. Consumer co-ops support families raising children in various ways, wishing for the realization of a child-friendly society. Co-op stores and distribution centers offer spaces for children and parents to play and interact with each other. As a means to tackle the problem of child poverty, some co-ops operate Children’s Cafeterias which provide meals for children who cannot eat enough at home for some reason or teaching activities. Several consumer co-ops run nursery schools or after-school centers. JCCU conducts survey on household budgets nationwide. Consumer co-ops hold seminars on life planning and household financial management. JCCU has conducted survey on household budgets with registered monitors of co-op members since 1996, with the cooperation of member co-ops nationwide. The purpose of these surveys is to understand and share the actual living conditions of consumers. In 2017, 1,360 member households from 40 co-ops answered the questionnaire. JCCU also surveys the Consumption Tax Burden on consumers. In 2017, 341 members from 31 co-ops answered the questionnaire. Consumer co-ops operate two types of home delivery businesses. One is to deliver to individual homes, and the other is to deliver to groups of members at a designated place or at workplace. Consumer co-ops provide meal sets to the elderly who have difficulty cooking by oneself. Co-op Sapporo initiated its meal delivery service in 2010. The meal sets, supervised by nutritionists, are chewable, swallowable, and well-balanced in nutrition. This service also plays a role of watching over the elderly living alone. In October 2017, Miyagi Co-op started an activity to give gift boxes, called Sukusuku Box, for new parents. The box contains a photo album and various items helpful to child-rearing provided by partner companies. Consumer co-ops run various formats of stores from movable store and convenience store to supermarket, serving the needs of the communities. Co-op Kagoshima educates store staff about customer service to people with dementia through Dementia Supporters Training seminars. In the seminar, participants learn how to support customers with dementia through case studies. As a means of supporting the elderly who have difficulty in shopping, Co-op Oita started a free transportation service, called Shopping Support Car. This service gives the elderly a ride to the store nearby once a week, free of charge. Eight stores support this service, with senior-friendly vehicles which accommodate eight passengers. Consumer co-ops provide mutual insurance. Consumer co-ops hold life planning seminars and also provide members with training programs to become a lecturer of life planning, called Life Plan Advisor (LPA). As of 2017, 1,584 members nationwide are an LPA. Consumer co-ops provide welfare services, centering home nursing care. Day Service Gamagori run by Co-op Aichi received the grand prize of the 5th Aichi Welfare Service. It provides elderly care, having two pillars, self-reliance support and enjoyable physical exercise, with the aim to enable users do activities of daily living. The day service center continues to improve the quality of the service by promoting the application of the “10 Basic Care by Co-op” introduced by JCCU. JCCU develops and distributes CO・OP Brand Products in cooperation with member co-ops reflecting members’ demands and opinions. During the brand refresh from FY2015 to FY2017, JCCU revamped more than 4,100 products. In April 2017, JCCU launched a new sub-brand for infants, “CO・OP Kirakira (Twinkling) Step,” reflecting the opinions of members who have small children. JCCU launched a new sub-brand for infants CO•OP Kirakira Step"
The FY2017 sales of CO・OP Brand ethical products, listed on the right table, is estimated to be about 92.3 billion yen at the retail price. Social contribution donations to social contribution activities were about 21.6 million yen. Consumer co-ops are holding learning activities about ethical consumption for their staff and members. In addition to quality and safety management of CO・OP Brand Products, JCCU shares the inspection results with member co-ops and responds to members’ inquiries. In FY2017, JCCU performed 2,087 factory inspections and 22,415 product inspections. The number of co-op members’ inquiries about CO・OP Brand Products were 17,566. JCCU has continuously been conducting investigations on the “radioactive material intake from domestic meal” since FY 2011 in collaboration with its member co-ops nationwide. Consumer co-ops promote initiatives toward a sustainable society in collaboration with co-op members and local communities. Towards the realization of the 2030 Environmental Target, co-ops are making various environmental efforts. JCCU and its member co-ops set “Greenhouse Gas Reduction Plan” in FY2005 to reduce the emissions in co-op business activities, and have continuously made effort. The 2020 goal is to reduce CO2 emissions by 15% compared to FY2005. In order to achieve this, co-ops have been installing energy-saving systems in new stores and introducing LED lights and other energy-saving equipment to existing stores. As a part of efforts to achieve a sustainable society, many consumer co-ops are engaged in renewable energy generation. Consumer co-ops promote waste reduction as a part of the reduction of environmental burden. Many co-ops collect recyclable materials at stores and by home delivery trucks. Also, charging for plastic shopping bags at stores, with the aim to call for the use of eco bags, is becoming widespread. JCCU and its member co-ops have been engaging in the support for UNICEF since1979, the International Year of the Child. In addition, there are several CO・OP Brand Products aiming for contribution to an international society. Part of the proceeds from sales of these products is donated to UNICEF and other international organizations. JCCU, on behalf of consumer co-ops nationwide, has built a good relationship with the International Co-operative Alliance (ICA) as one of its member organizations. JCCU also has been strengthening relationships with co-operatives and organizations across the world and participating in human resource development programs to support the development of consumer co-ops in the Asia-Pacific Region. JCCU also has been collaborating with the International Labour Organization (ILO) in organizing an annual study tour to Japan for African co-operative leaders for years. JCCU dispatches staff to ICA-AP Malaysia Business Office and ILO COOP. JCCU co-sponsors an annual peace event, called Peace Action, held in two locations, Hiroshima and Nagasaki, respectively with Hiroshima Consumers' Co-operative Union and Nagasaki Consumers' Co-operative Union for the purpose of sharing A- and H-Bomb Sufferers experiences and to call for the abolition of nuclear weapons. Both events bring in thousands of members, co-op staff, and citizens, having various exhibitions, learning programs, art performances, including those targeting children and families. Okinawa Consumers Co-operative Union and JCCU co-organize annual Okinawa old battlefield and American Military base tour for Co-op members to learn about the fact of the battle of Okinawa of World War II and the current problems surrounding the US Military bases in Okinawa and think about peace. Every year around two hundred Co-op staff and members receive lectures and participate in study tours, including a study tour for families with school-age children. Co-opdeli Consumers’ Co-operative Union started ”Rice-fed Pork Project” in collaboration with rice farmers, pig farmers, and feed manufacturers in FY2008. It is a project to produce rice as animal feed utilizing unused farmlands, feed pigs with the rice, and to produce and distribute Sanchoku pork. Starting with producing 175 tons of rice to breed 9,500 pigs in FY2009, the project reached 1,999 tons of rice and 80,758 pigs in FY2017 by holding tasting events and exchange events with producers to gain members’ interest. Use of rice as animal feed is now spreading to cattle farmers and poultry farmers. Co-op Kobe started a project to promote consumption of fishery products in Hyogo Prefecture with JF Hyogo-Gyoren, the local federation of Fisheries Co-operative Associations in FY2014. The project is called “Torepichi”, aiming to distribute fish products not on the market through exchange events with producers, campaigns at co-op stores, and cooking workshops. “Toreshaki,” another project to promote consumption of agricultural products in Hyogo Prefecture, started in FY2016. Through events like cooking workshops at co-op stores, Co-op Kobe aims to spread the goodness of locally produced vegetables to co-op members. Consumer co-ops promote dietary education for the purpose of promoting healthy eating habits. Many co-ops hold production site tours and cooking workshops for members and provide visiting lectures to primary and junior high schools in their communities. JCCU and its member co-ops work on building a network of all Japanese consumers, collaborating with administratives, consumer organizations, and experts. Co-ops support activities of Qualified Consumer Organizations that have the right to demand an injunction against unfair practices by business operators on behalf of individual consumers. Co-ops also exchange opinions with administratives and hold study programs for consumers, e.g. training courses for consumer damage prevention, and seminars on household energy. Consumer co-ops aim to make their organizations more inclusive so that diverse people of different employment statuses and different life stages can continue their careers. In March 2018, JCCU established Human Resource Management Support Center to support and collaborate with member co-ops to promote this initiative. In November 2017, JCCU held an exchange event for young women working at consumer co-ops nationwide. Since co-ops operate their businesses independently of the others, it was a valuable opportunity for participants to receive a lecture and exchange opinions actively as women working in different co-ops.